is there a url for the log from yesterday? it is hard to hear - are you voting from items on http://esw.w3.org/topic/BestPracticeTaskForces or somewhere else? GK has a "point of order": one of the topics noted yesterday isn't in the WIKI: "Integration of reasoning tools, and application-specific computation"
...which bullet was it subsumed by? I'm an observer, so my vote doesn't count, but as someone who is interested in actually applying sweb, I select: "Design Patterns (part whole, defaults)", "RDF in XHTML", "Integration of reasoning tools, and application-specific computation"
second straw poll: which do you expect to participate in? i do not see any listing here for the ontology design issues but i would expect to work on that. now i see the list on the agenda page. chaals, I think I understand. I guess I just wanted to inject a note of reference to the "deployment" aspect of this WG. I worry about a lot of Owl/Ontologies things at the top of the list; while the world is still looking for practical guidance on simpler RDF issues - i.e. we may be running too far ahead of the crowd; and risk looksing them in the process. Ralph: Background - RDF started out thinking that mixed namespaces would solve the mixing content problem, and when XML schema came out it didn't quite get it. ... so we have 3 activities trying to find a way forward. A year ago we asked people interested in this question to get together, and launched a taskforce under the Hypertext and SemWeb Coordination Groups. ... originally led by Joseph Reagle, now by Dom Hazael-Massieux. ... part of the results are some work done by Dan Connolly and Dom, another input comes from Mark Birbeck. ... one came informally from HTML group, another was based on stuff Dan Connolly had talked about. ... often you want to store machine data inside documents meant for people. First need is information about the doc. Etc. ... where it turnns out that etc is a pretty-much infinite requirement, as seen in 1993. ... 1996 - PICS came out in response to an acute need. ... PICS also gave the idea of external people being able to say stuff, not just the author. ... 97/8 XML becomes "the one syntax to bind them all". 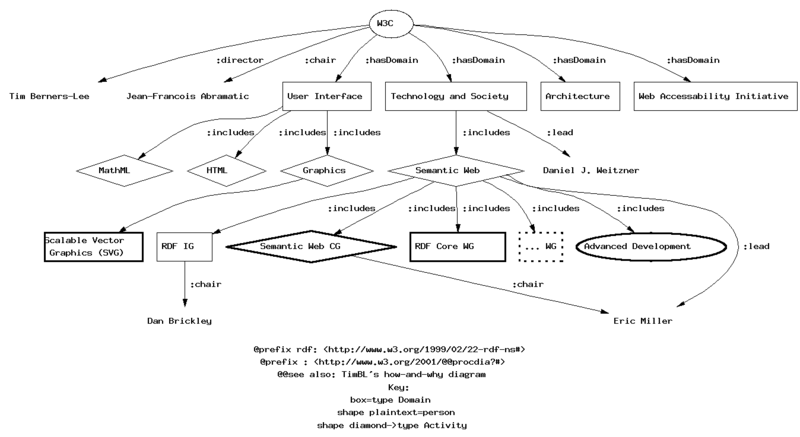 ... Design of RDF was early adopter of namespaces, and skipped DTDs to anticipate XML schema. ... People note that you get jumped on by the validator if you follow the initial non-normative recommendation. ... "we need features more than standards..."
So people put stuff in comments. ... gets to GRDDL slide. ... there are many ways of extracting different data - you pick the one that gets the stuff you want and turns it into RDF. Then you put a link to it, with a rel grounded by a profile. ... so "choose your favourite conversion, put a link to it with a particular rel/profile. Price to pay includes that you use XSLT for the conversion". ... XSLT has issues, but in userland people do actually have it on their machines. [do you actually have to fetch the whole resource itself (and be allowed to do so) in order to be able to extract the rule to get to the about data]. ... Syntax then gets to be chosen by the particular sub-community of one or more. Mark Birbeck presenting his stuff. Mark: how many people were in the SWIG discussion on this? Mark: HTML have slightly different goals to the RDF group. ... were working on XHTML 2, and wanted to knwo what to do with meta. At the same time we tried to see if we could make RDF stuff easier to get out of HTML. ... We tried putting RDF attributes in RDF namespace so you could attach an RDF parser. But it didn't work because you had to keep indirecting the predicate stuff. ... So we tried to make the same structure, without having to do anything terribly complex fromm the perspective of HTML authors. ... So we have a meta and link - one has object as a literal, the other as an href / resource. This is what people are used to doing already in HTML. ... We renamed a couple of things - property instead of name, for specifying the predicate. It can go inside. ... then we allowed nesting. Which is one of the things that XHTML already has as a general evolution pattern from HTML. ... went back to the RDF notion, to work out how to interpret the nesting structure - where do bnodes appear, etc. ... Introduce an "about" attribute - can be about a part of the document (something that was missing in meta). ... shows an example of how to use this to replace the cite attribute. A goal is to reduce the number of special-purpose constructs in HTML if they can be grounded in the semantic web. ... shows some examples of different constructs. ... Put together a document to see if it can be converted, GRDDL-style. No problem. a short XSLT (even including comments) that produces N3 (ergo, should be trivial to convert to RDF/XML instead). [no, I'm thinking about changing the XSLT, not GRDDL. SP: Our intention is to make this a module that any language can use. You can decorate your content with statements about it. jjc: one approach or both? I think that the likelihood of tool support (in HTML document editors) should be a consideration. RalphS: stresses that the point is "what do the 2 groups need to share"
Re. JimH comment about MIME types, I don't think they're broken, but maybe MIME is being expected to do more than it was designed to do. Danbri - feel free to prod/rely on me/David for help here. I think Pat's message also alludes to an issue of deciding whether a 3rd-party ontology(author)'s intended usage is compatible with one's own intended usage. RESOLVED add to the TF list an item "how to cope with evolving ontologies"
<gk>I think Pat's message also alludes to an issue of deciding whether a 3rd-party ontology(author)'s intended usage is compatible with one's own intended usage. RESOLVED add to TF list "working with multiple ontologies"
4 hands raised to work on versioning guidelines? GuusS: all of top 5 low hanging fruit? DanC: this time ontology seems to be done to ChrisW's satisifaction. I'd love him to present it to the rest of us to see if it's done to our satisfaction. Either it is, [in which case we can endorse it somehow] or it isn't, in which case we shoudl write up why and maybe help fix it. didn't chrisw take an action to present the time ontology to us? GuusS: asking for TF leaders - who's willing to lead "Demos and applications"? DanC: Libby would you be prepared to bring the "demo stuff" in front of the group? people seem to be happy to get *all* mail in their inbox ?! Deb: did you define what it means "to coordinate a TF?" GuusS: asking for coordinator "Porting thesaurii to the Web"
however i will drop off at your lunch break so it would be good if someone there would co-run with me and take notes in the afternoon. RESOLVED Deb and Chris to corun "Design Patterns and Issues"
RESOLVED OscarC to lead "Tools page" and/or "education"
further asking for volunteering to coordinate: BernardV for "Link to TopicMaps" and MarcoN for "Links to related techniques: MPEG"
BenA: concerned about the "deployment coordination"
JeremyC: maybe a "Deployment chair..."
Guus: July doesn't work for me. ... but thanks for the offer. ... mailing list: in WebOnt, we had a WG mailing list and a comments list; I gather that's normal for REC-track work. ... does it seem like a good idea to use the label "ALL" for stuff all the WG should read. ... also, the chair will help a lot with references from the agenda to things you really should have read. Guus: yes. For example, decisions to be taken will normally be in the agenda. Guus: so I'll use "ALL" for mail to the whole WG. please edit the subject line if you follow-up. Guus: how about post-access to the list? JJC: let's not put technical barriers, but establish a norm that it's WG members who post. ... but I don't want to preclude brief cross-WG discussions. Ralph: we can use "anybody subscribed to any W3C mailing lists can posts"
Guus: OK, so chair/team contact will gently enforce the "only WG members should post" norm. JJC: e.g. conference announcements should not go to the list. Guus: as much as possible, use plain text email. Occasionally HTML, valid please. Maybe PDF in extreme cases. Don't send proprietary attachments. will the example be in pdf? Guus: don't send html-only email. it's ok as an alternative. Oscar, Aldo: are you OK with "Ontology Patterns and ENgineering" as the name of our Task Force? Guus: with my disability, it really makes a difference. RalphS: do we care who's allowed to subscribe to the list? JJC: why limit whether they can use HTTP or SMTP? DanC: I suggest the team contact will bear the costs of this decision; I have some advice I'm happy to give offline. Guus: charter says approx. every 2 weeks. ... tradition is to use a fixed time in the week. ... agenda is due 24 hrs in advance. will contain links to other stuff. ... teleconference bridge is based in Boston (+1-617-...), "Zakim". ... then you key in a key code. Bernard: pls give it in UTC. Guus: yes, we'll give it in UTC plus a few other convenient timezones. Guus: we use an IRC as a supplement to the teleconference, for notes, queue management, etc. Though we realize not everybody has real-time access to it due to local IT policies etc. ... it might seem impossible to have a reasonable conversation with 25 participatns, but it actually works. Chair is the only one with the privilege to interrupt. And the scribe. RESOLVED: to have telcons at 1500Z thursdays for the 1st 2 months. ... for 60 to 90minutes. Jos: where should we send regrets? Guus: I'm ok if you send them to the chairs. Ralphs: and to the team. Guus: if the regrets come 24hs in advance, I'll try to reflect them in the agenda. RalphS: process does require 8 weeks notice. Guus: there's also the tech plenary in March 2005 in the Boston area. semweb conference in Hiroshima seems to be 7-11 Nov 2004. Guus: I have a conflict for July, and it's soon, so Deb's AAAI suggestion doesn't seem workable. Guus: Aug/Sep [?] seems ideal. JJC: PROPOSED: to meet at the tech plenary next yera. Guus: I welcome any proposals to host. ... perhaps to discuss at the next telcon. ChrisW: I'm happy to host at IBM Watson in NY. JJC: HP's always happy to host, but I don't think Bristol, UK is geographically appropriate. MikeU: I can look into hosting. JJC: I could host in Palo Alto too. JJC: I have some anxiety about public review of our docs... we should do a 2nd version after publication as a note. ACTION DanBri: ask SemWeb CG about constraints and advice re WD, Note, etc. Chris: "Ontology patterns and engineering"
A Working Group MAY publish a Working Group Note with or without its prior publication as a Working Draft. W3C MAY also publish "Interest Group Notes" and "Coordination Group Notes" for similar publications by those types of groups. Interest Groups and Coordination Groups do not create technical reports that advance toward Recommendation. ... how about saying "hello" to some other groups? Guus: let's talk about that at an upcoming telcon. sounds interesting. JJC: would you care to draft something, Bernard? DaveB: what dependencies exist between SWBPD and DAWG? DanC: one possibility envisioned was that BPD saw querying as a high priority for a Best Practice, that hasn't seemed to have happened? Mike: how about things that we didn't decide to start? Guus: I intend to revew those at the end of some telcons. Mike: if I'm going to do that anyway... should I do that independently? JJC: I've got a few things that didn't particularly interest this group; I'm working on them elsewhere; perhaps I'll bring them back here when they're more baked. Guus: thanks much for the participation despite the short notice! RESOLVED to adjourn, with applause to Guus for chairing.